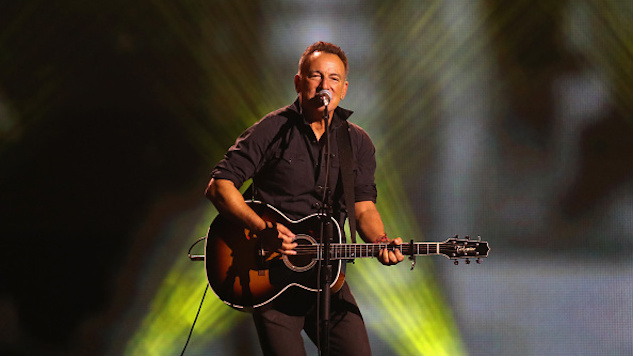 Bruce Springsteen will perform live at the 72nd Tony Awards this Sunday, June 10, USA Today reports. He’ll take the stage at Radio City Music Hall at some point during the telecast of Broadway’s biggest night, which is broadcasting beginning at 8 p.m. ET on CBS. The legendary musician is currently in the midst of a 13-month Broadway residency. Originally intended for an eight-week run, Springsteen on Broadway, the Boss’ one-man concert extravaganza that kicked off in October of 2017, is now slated to run through December of this year. Also during Sunday’s broadcast, Springsteen is scheduled to receive a special award for Springsteen on Broadway, which continues to sell out the Walter Kerr Theatre in New York City. Two of the most talked-about Broadway musicals of the year, Tina Fey’s Mean Girls and Spongebob Squarepants, are each nominated for 12 Tonys each. In the play category, the Angels in America revival and Harry Potter and the Cursed Child, Parts One and Two lead the pack with 11 and 10 nominations, respectively. Sara Bareilles and Josh Groban, who have both appeared in Broadway shows themselves, are this year’s hosts. For more about Springsteen on Broadway and ticket information, visit the show’s website. Looking for some vintage Bruce? Check out Born To Run-era video footage from a Springsteen concert dating all the way back to 1977, below. While you’re at it, check out our ranking of the 25 best Springsteen songs.